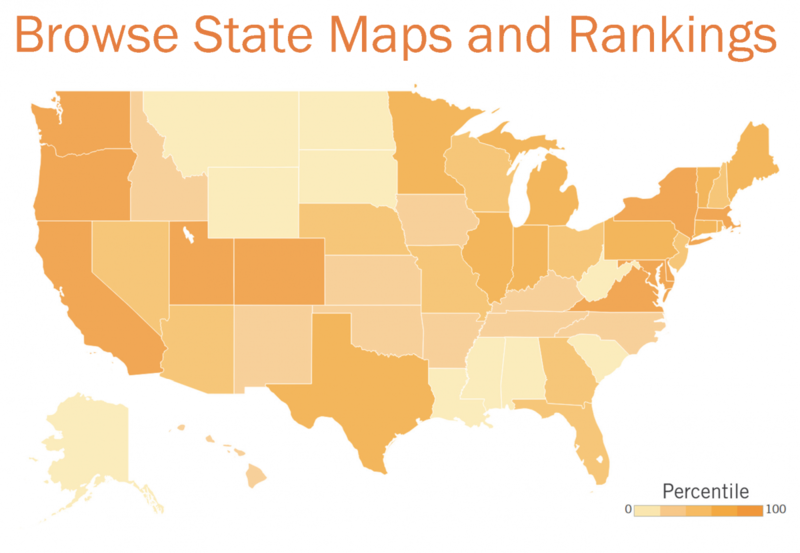 First-of-its-kind report reveals which states are best for data innovation. Smart policy is indispensable in the data-driven economy. Which states are setting the bar? While data-driven innovation is a global phenomenon, some regions are better poised to enjoy the resulting benefits because they have invested in and supported the conditions necessary to succeed in the data economy. This is also true within the United States. Recent technological advancements—such as faster computing, better algorithms, and more robust communication networks—have made it easier and cheaper to collect, store, analyze, use, and disseminate data. These changes have led to the emergence of the data economy: an economy where success depends on how effectively firms can leverage data to generate insights and unlock value. Better use of data will be a crucial driver of economic and societal progress in the coming decades. The widespread adoption of data analytics and artificial intelligence is expected to contribute hundreds of billions of dollars to U.S. GDP in the coming years in sectors such as finance, transportation, and manufacturing, while unlocking new opportunities to improve outcomes in fields such as education and health care. In addition, the growing adoption of the Internet of Things—ordinary objects embedded with sensors and connected to the Internet—is unleashing a wave of innovation and growth as billions of devices that collect and use data come online. And state and local leaders are investing in smart cities to leverage data to create sustainable, resilient communities. Given the significant economic and social impact of these developments, policymakers should be leading the charge to enable data-driven innovation in their states. This effort should encompass not just the development and growth of data-driven companies, but also the use of data to address their states’ most important priorities, such as improving health care, reducing crime, developing sustainable communities, and improving schools. While data-driven innovation is a global phenomenon, some regions are better poised toenjoy the resulting benefits because they have invested in and supported the conditions necessary to succeed in the data economy. This is also true within the United States, where some states are actively building the necessary foundation for a thriving data economy and others are lagging. Decisions made today that affect the extent to which a state participates in the data economy will have long-term implications for its future growth, as data plays an increasingly larger role in many different sectors across the economy. Early adopters will benefit more quickly from using data to address a multitude of challenges, and by positioning themselves at the forefront of data-driven innovation; they also will be able to grow and attract data-driven companies in a wide range of sectors that will make them the future hubs of the data economy. People and companies: human and business resources, such as the number of open-data companies in the state, and the size of the data professional community. State policymakers should support all three areas to successfully enable data-driven innovation. First, states should take steps to guarantee that data is available for use, such as by ensuring government agencies collect and release high-value datasets. Open government data promotes transparency, encourages citizen collaboration, and creates value through innovation and efficient decision-making. Making data available can also provide the private sector with the building blocks necessary to develop new products and services. For example, the Chicago-based start-up SpotHero, which makes a mobile app to help drivers find and reserve parking spots, relied heavily on open government data for its initial development. Government agencies can also use data to improve their services and be more efficient. For example, with no additional investment, Oregon’s state marine board used its state’s open data platform to replace its biennial boating handbook, which cost $150,000 to produce every two years, with a live, interactive map with location-specific regulations, docks, service stations, and navigation instructions for boaters. The U.S. Department of Commerce estimates that the private sector uses government data to generate annual revenues of as much as $221 billion annually. And, globally, the McKinsey Global Institute estimates that open data has the potential to create $3 trillion to $5 trillion per year in additional value across education, transportation, consumer products, electricity, oil and gas, health care, and consumer finance sectors. Second, states should enable the deployment of the technology platforms that underpin success in the data economy. This includes facilitating the deployment of digital infrastructure, such as fixed and mobile broadband Internet, plus data platforms such as intelligent transportation systems, electronic health records, and smart meters. In addition, states should consider how they can support the development of the Internet of Things, particularly the development of smart cities that use data collected by sensors on physical infrastructure and digital transactions with government agencies. Third, state economic development efforts should include a focus on the data economy and helping transform existing industries to make better use of data. For example, better use of data and analytics in health care—to allow doctors to make better medical decisions and provide better preventative care—could slash costs by up to $450 billion. Reforms can start with developing the human capital necessary for data-driven innovation to thrive, and supporting businesses participating in the data economy. Virtually every sector of the economy can benefit from better use of data. But the growth of data-driven enterprises will be limited by the availability of workers with in-demand data skills. To this end, states should promote the growth of data-driven businesses by improving educational offerings in data science and related fields. This begins at the K-12 level, where strong math and computer-science training can equip students with the skills necessary for advanced data literacy, and continues through higher education, where degrees in technical fields can provide the highly skilled workforce needed to participate in the data economy. States should also strengthen connections among businesses, government agencies, and universities to encourage collaboration and learning among those working on data-related projects across a diverse range of industries. How Is the Federal Government Using the Internet of Things?